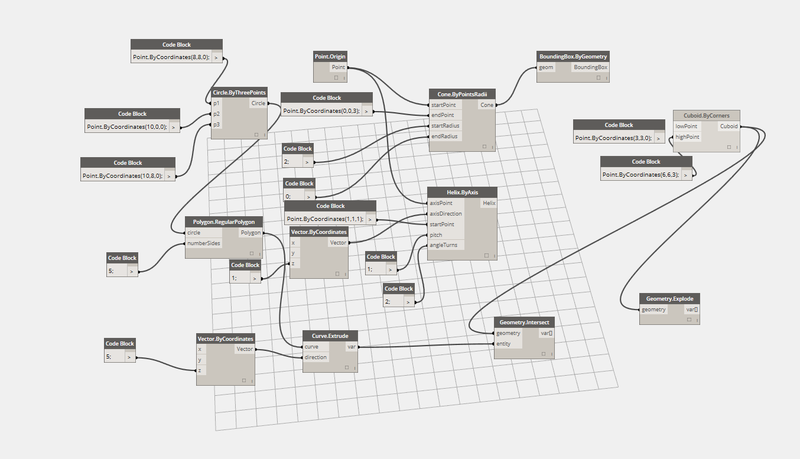 This blog post will briefly go over the basics of Dynamo and the Dynamo interface so if you are a beginner to Dynamo you will be familiar with its environment. 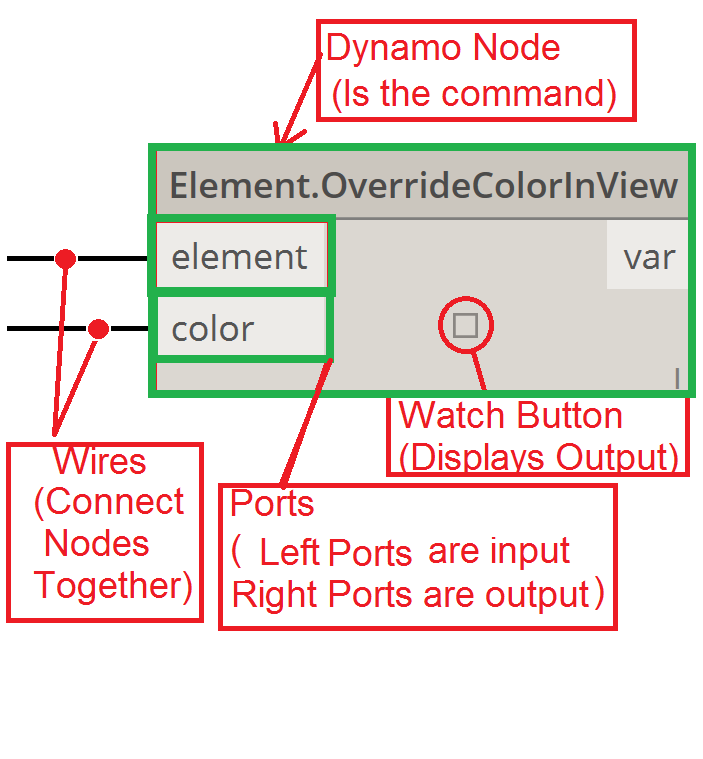 Below is a sample Dynamo program that uses visual programming so all the "commands" are in the form of nodes (boxes) and the nodes are connected by "wires" so the information could flow between nodes. If you have not done so already please read the previous post on "What is Dynamo?" so you have the basic understanding of what Dynamo is. Nodes (as shown in the Figure below) are the boxes you place and connect together with Wires to form a program. Nodes can represent any Function of the API and Wires connect between Nodes to pass information between nodes. Wires connect the output Port from one Node to the input Port of another node. To create a wire simply use the mouse and left click hold and drag from one port to another port. Wires are dashed while being dragged and then turn solid when connected. You could also pull the wire away to disconnect it from the port. Information flows through the Ports from left to right. See the Figure below for all the nomenclature on the Dynamo interface. When you download the latest version of Dynamo simply click to install it. It will then show up under your “add-in” tab in Revit. Click on the Dynamo button and it will open a separate window that is the Dynamo interface. Its best to use dual monitors when using Dynamo. The Pulldown Menu is used to open and save dynamo files, to copy and paste operations, change settings and also access the “Package Manager” The Package Manager allows Dynamo users to create custom Dynamo nodes using either Python Scripting or Nesting other nodes into eachother and then posting them as a “Package” so other Dynamo users could use them. Yes that’s right if you want to you could become a Dynamo developer and share your custom content! The Node Library is similar to the view and browser in Revit where it shows all the available nodes to be used. 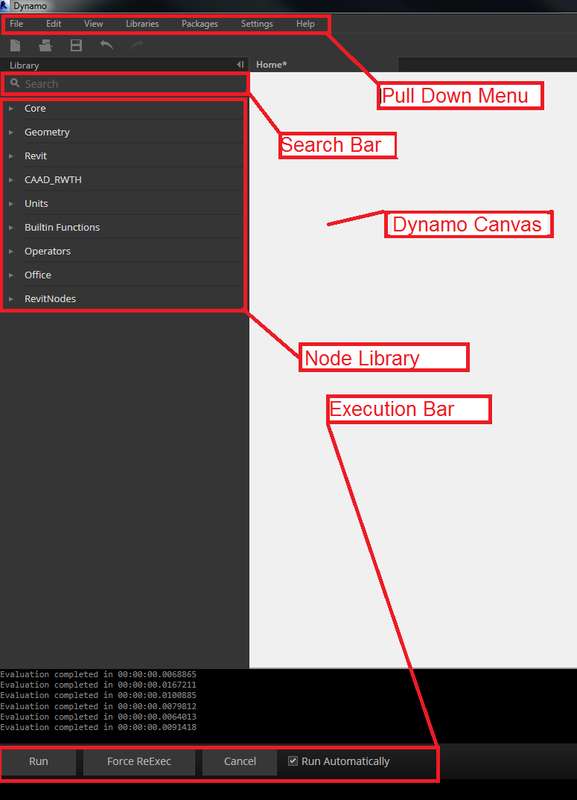 The Dynamo Canvas is the main “workspace” environment for creation of all Dynamo visual programming. The Execution Bar runs or executes the current workspace. What is unique to programming in Dynamo is the ability to run the program in “real time” and if you want to do that simply click the “Run Automatically" box. 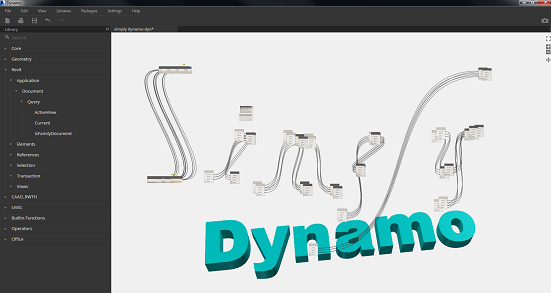 There are the basics to get you started in Dynamo. Good luck visual programmers!